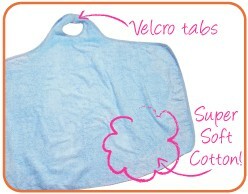 At last a baby towel that frees your hands to lift baby safely from the bath... while you stay perfectly dry. The Little Beetle Bath Towel is worn around your neck and secured by Velcro tabs, leaving your hands free to bathe your baby. Your clothes remain dry, and it's safe and easy to take baby out of the bath ... no more struggling to reach for a towel while holding your baby! In stock - white only. Colour availability - white, pink or blue. if you would like to order pink or blue. Presented in a lovely 'Little Beetle' branded gift box.